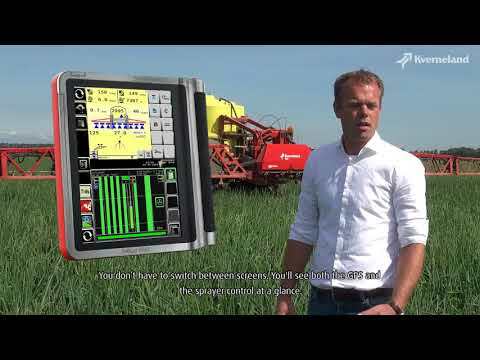 The Kverneland iXtrack C trailed sprayer is developed with big focus on operator comfort and environmental protection. The iXtrack C offers tank volumes of 3000, 4000 and 5000 and 6000 litres in combination with HSS 18-40 metre steel booms (18-30m 2-part folded and 27-40m 3-part folded) or HSA 24-33 metre aluminium booms. The third available boom is the HBWP with 45 metre boom width. It has a low centre of gravity and compact dimensions for higher working speeds and easy transportation on the road. The iXtrack C is also available with ISOBUS intelligence for features like the IsoMatch Tellus PRO terminal, iXflow recirculation system, IsoMatch GEOCONTROL, Ergodrive head land management and Boom Guide spray height control system. iXclean Comfort or iXclean Pro will give you even more operator comfort as functions like filling, spraying, rinsing and so on can be controlled out of the tractor cabin! All wheel axles can receive hydraulic or pneumatic brakes as an option. The iXtrack C is standard equipped with a hydraulic suspension system to ensure smooth suspension, but only small height variations aiding booms stability and constant nozzle height. It is a dynamic system: stiff suspension with full tank and smooth suspension with an empty tank.